Reader, Beware! Slight Spoilers Ahead! Big Finish’s latest Dark Shadows epic gets an engagingly charming opening trio of episodes in the start of Bloodline! Full disclosure, the early(ish) start of this serial kind of caught us a bit flat-footed here at the CHS. Mainly because we have been planning something truly special to cover this newest series. Something a bit more specific and theatrical. Something that is still very much in the works for you all! BUT, me being the “audio correspondent” and currently lowest on staff intern (I actually WAS above one last week, but he took lunch down by the docks the other day and then never reported back, so either he got Levianthan’ed or quit), it fell to me to at least get something on record about the opening episodes. And the record will show, IT IS FRIGGIN’ GREAT! Chock to the gills with some classic Dark Shadows set ups and wonderfully acted by a game cast, filled with returning favorites and new icons, these opening three really bait the trap well for the first “volume” of episodes. Bloodline might have been a long time coming, but if these opening episodes are any indication, this series will have been well worth the wait. Firmly set after the events of Bloodlust and ...And Red All Over, Bloodline finds Collinwood a’buzz with excitement for the upcoming nuptials of David Collins (Alec Newman) and Amy Jennings (Stephanie Ellyne). But a new stranger has come into town, as strangers are the moth to Collinsport’s flame. One by the name of Vivian Bell, played with aplomb by series newcomer Georgina Strawson. Bell’s storyline is one of the many, many juicy plot setups these first few Bloodline episodes deliver. Along with beautiful stranger comes a whole other heap of story hooks that writers Alan Flanagan (ep. 1), Rob Morris (ep. 2), and Will Howells (ep. 3) lay out across all three episodes. 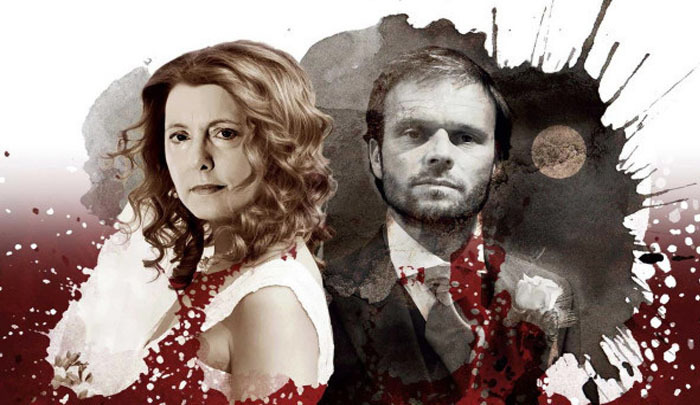 Lovingly staged by the wonderful sound design and music of David Darlington, we have grounded family drama centered around Bell and her connection to Harry Cunningham (who again, with the rest of the younger cast members, gets some ample time in the spotlight). The writers sweeten the grounded plot pot with some choice romantic triangle action, consisting of the consistently lovely Newman and Ellyne, with the added charge of Strawson’s Viv Bell. We also get plenty of supernatural aspects weaving in and out of the story. Elements like body switching, an unseen dark force stalking Cody and Harry (who have BROKEN UP, apologies, shippers, I mourn with you), and a voice that sounds awwwwwwfully like The Sixth Doctor’s coming out of the cave at the base of Widows’ Hill! And I hear you asking, “Justin, what about the Vampire Curse?”, well, buster, hang on to your hat! These first three episodes introduce a real meaty subplot centered around Barnabas’ feeding habits that I am very interested to discuss with you blood freaks out there. Let’s just say, it takes a village, and leave it at that. 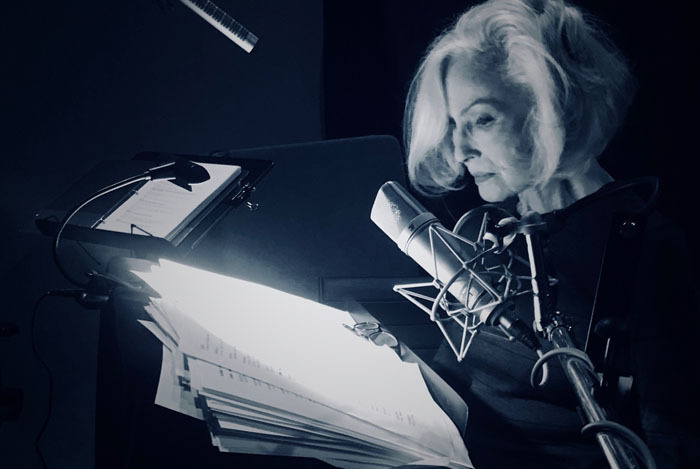 Julie Newmar records her dialogue for Dark Shadows: Bloodline. But let’s get to the Catwoman-sized elephant in the room. Julie Newmar is absolutely incredible as The Second Dr. Julia Hoffman. Cleverly “regenerated” not unlike Andrew Collins’ (who also impresses in these opening installments) new Barnabas, Newmar folds into the cast beautifully with an honorable, very specific performance. Newmar’s timbre and line delivery is slightly odd and purists might be a bit off-put by a new actor playing Hoffman, but for my money, she’s perfect. There was only one Grayson Hall and there is only one Julie Newmar. But both of them stand well aside each other at the moment. I mean, it would have to take a true disaster for Newmar to ever disappoint me, but I really think you all will love her. I can’t wait to see what else she does with the good doctor. I know a lot of this sounds vague, and I will admit a certain reticence to talk about some of the best developments. Here is a quick contextless list of some further selling points of the story so far. The return of the Old House! Jackie’s hilarious dialogue! (she refers to Barnabas’ transforming powers as “The Bat Thing!”) David Selby! The return of a major antagonist! And to know any more, you are just going to have to listen to them for yourself. (And then maybe listen to me and the chief talk about THEM further on down the road). But rest assured, fellow fans of the macabre, Bloodline Episodes 1-3 are well worth your money and time. Especially if you liked Bloodlust, or have invested the amount of time in the Big Finishverse that dorks like us have. It truly is great stuff. Another wonderful showing from a group of dedicated creatives and their cast, who bring it to life with fun, reverent performances. It is the best possible scenario for a follow up miniseries. Keep a weather eye peels for LOTS more coverage of this series as it continues. Until then, be seeing you.